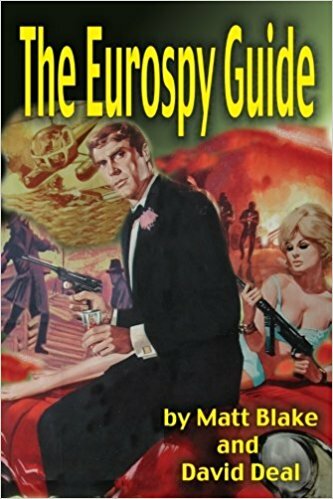 The Eurospy Guide is a nifty reference book for anyone looking for a great way to delve into the espionage films of the 1960’s. Full of great reviews and great information it is a must have for anyone who loves the spy films that were produced in the wake of James Bond. Of late I’ve been watching a lot of Eurospy films. I’ve been going through the Kommisar X films, the OSS 117 film and a bunch of others (reviews of the various series will appear later in the year) and I found that I really needed something to sort out what I was seeing. The IMDB didn’t always have the information I wanted and Wikipedia often was woefully incomplete. While not all inclusive (the book intentionally only covers the films of the 1960’s and doesn’t cover some Eastern European films) the book is still a bounty of information. Authors Matt Blake and David Deal wonderfully give any film fan a lot to mull over. Backstories are here, information on actors is revealed and unexpected connections between films are exposed. This last point is important because here in the US many of the films many films can be found with differing dub tracks depending upon who released them originally. Since many films are out in the US in the gray market one distributor might have a Euroaudio track while another might have a US distributors track. Names might have been changed. As a result I never caught that several non- Lemmy Caution Eddie Constantine films are related. I love this book. It’s become my current reading material as I bounce between films looking for films to track down to watch. I can’t recommend it enough. If I was forced to say one thing bad about it it would only be that it appears it hasn’t been updated since it was first published in 2004. I’m sure they could have included more films if Blake and Deal updated it since the internet has made so much more available. That minor quibble aside what here is choice and very highly recommended.